Home Meditation	How to unblock energy blockages to your Chakras? How to unblock energy blockages to your Chakras? All disease of the body and mind originate from energy blockages from within the human energy field. From birth we’ve been indoctrinated by the speech, inhibitions and limiting thought processes of the cultures we’re born into. Because of this we’ve forgotten our connection to the Universe and lost awareness of the divine light from which we originate. Our divine internal light has dimmed, which when fully radiant gives abundant life to the body and illumination to the mind. As a result instead of our bodies and mind being service to us on this earth, it has become our prisons. The journey back to Source begins by freeing our energy body of the blockages we’ve accrued in our life. To do this we must unlearn what we have learned. According to the Shiva Samhita an ancient treatise on yoga, our body possesses 7 major Chakras and 350,000 subtle veins known as nadis in Sanskrit. These nadis are the vehicles which the life force known as prana or qi circulates throughout the body. While this prana gives life to the body, spirit, and mind, it also concentrates into swirling pools of energy known as Chakras. Limiting beliefs, emotional baggage and ignorance of self create blockages of dark energy in the nadis, thereby hindering the flow of prana through the Chakras. How do I unblock the Chakras? To unblock the Chakras and allow prana to flow through them is no easy task. It’s not as simple as laying crystals on your body or banging symbols while chanting modern nouveau mantras. Popular ancient yogic texts such as the Hatha Yoga Padapika and the Shiva Samhita describe a much more in-depth process to unblock the nadis within the body. Unblocking the Chakras must be approached holistically. The body along with the mind must be purged of heavy energy. The body and human energy field must become lighter and more fluid in composition through diet and mental realignment. The same food that clogs your arteries will also clog your nadis, so avoid eating heavy and fried greasy food. Seek to eat easily digestible food that is light, pure, free from GMO and pesticides. Drink lots of water daily, preferably naturally occurring alkaline water, and not ionized water. Alkaline water will purge your body of vein clogging acidity. Each Chakra is linked to an element, has a purpose and is blocked by a specific negative emotion or limiting negative concept. Just as negative emotions will cause tension within the body, blocking the flow of life-giving electricity and blood through the nerves and veins, likewise they will also block the flow of prana through the nadis. To release the blockages within the nadis, one must release the dark energies of Fear, Guilt, Shame, Grief, Lies, Illusion and of Separation from Source. 1st is the Earth Chakra, located at the base of the spine, it deals with survival and is blocked by fear. What do you fear most? Let your fears become clear in your mind’s eye, face them and release, allow them effortlessly flow away from you. 2nd is the Water Chakra, located in the pelvic area, its purpose is pleasure and it’s blocked by guilt. Look at all the guilt which burdens you, what do you blame yourself for? Accept the reality that life is about exploration, an evolutionary learning experience, do not allow these experiences to cloud and poison your energy. You need to forgive yourself and release all guilt from within you. 3rd is the Fire Chakra, located in the stomach, it’s governed by willpower and is blocked by shame. What are you ashamed of? What are your biggest disappointments in life? Know that in life, no power is going to judge you, so don’t judge yourself. Release all of your disappointments and allow yourself to be free. 4th is the Air Chakra, is located in the heart, it deals with love and is blocked by grief. Lay all your grief out in front of you, everyone has experienced some kind of loss, but there is no need to grieve for all beings are eternal. Love is a form of energy that swirls all around us, Consciousness moves in this energy moving from one life to another. Release the grief and allow it to flow away from you. 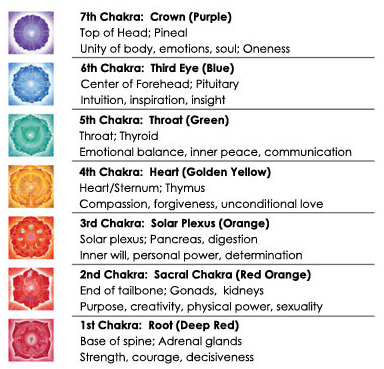 5th is the Sound Chakra, located in the throat, it deals with truth and is blocked by lies, the lies we tell ourselves. You cannot run from your own nature, you must accept who and what you are. Release your self-denials and the lies you tell yourself. Accept the truth of who and what you are, trust your feelings and live your life. 6th is the Light Chakra, located between the brows, it deals with insight and is blocked by illusion. The greatest illusion is the illusion of separation. Things we think are separate and different are actually one and the same. Like the different races, we are all one people, but we live as if divided. 7th is the Mind Chakra, located on the crown of the head, it deals with pure cosmic energy and is blocked by attachment. Meditate on what attaches you to this world. Face all of your attachments and release them, including everything you’ve grown to love. The greatest love is unconditional love, it enables you to love without attachment, a cosmic love that can let go.